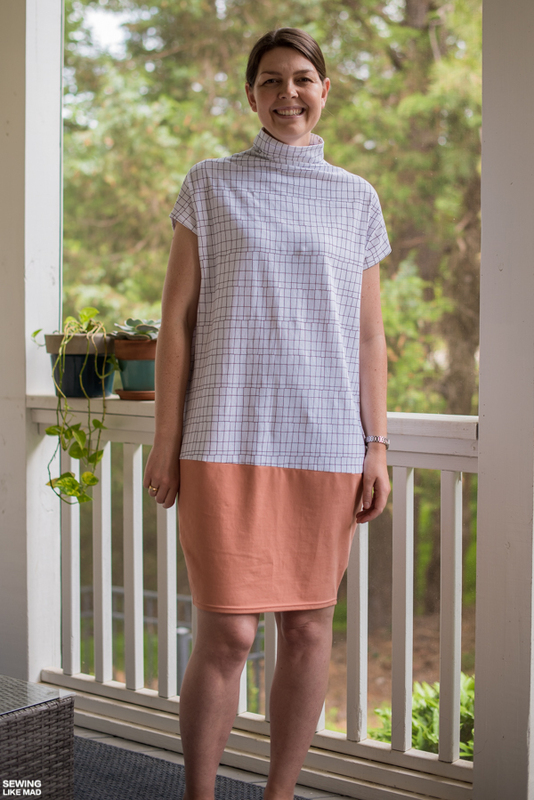 Sewing Like Mad: Modified Cher Knit Dress by Style Arc Patterns. 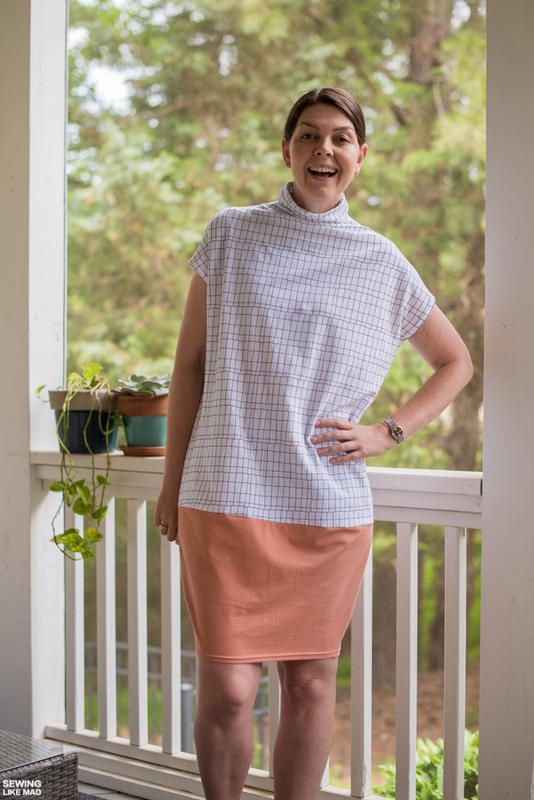 Today I'm blogging about my experience with the Cher Knit Dress by Style Arc Patterns. And oh boy was that an experience, ahem. Today is going to be one of the more complicated posts. Maybe you already guessed it, when you saw that it said 'modified' in the headline. Normally I don't modify a pattern the very first time I sew it.....unless the first sew up results in epic disaster and modification becomes necessary. Luckily it all ended very well and I absolutely love my new dress. Elegant and a bit different from other things in my closet. And with a few changes I want to make many more. So what happened? Well, I followed the fabric recommendations which are: "Jersey, pane, sweater knit or any stretch fabric" and that turned out to be a mistake. The fabrics I used are SO lovely but in combination with this particular pattern they didn't work out. 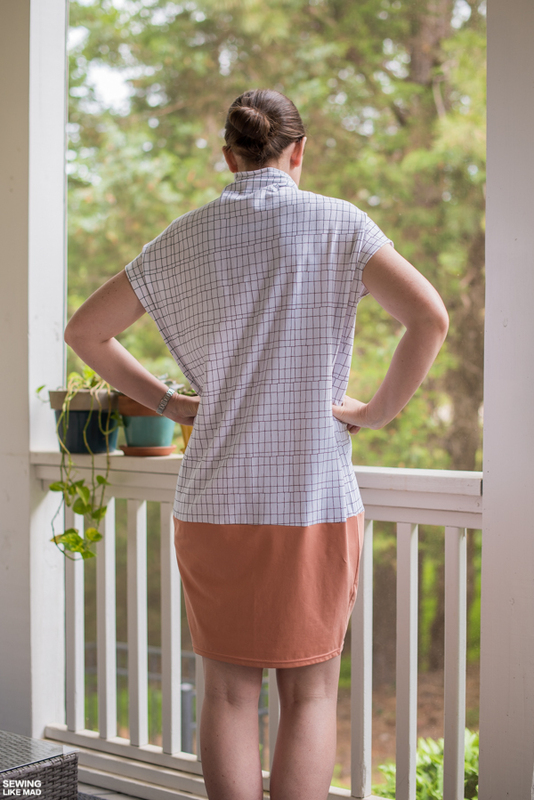 These are regular medium weight jerseys with 95% cotton and 5% elastane and they don't at all have enough drape for the rather significant cocoon shape that this dress turned out to have. I literally looked like an actual pear (the fruit not the body type) or a freaking Moomin, lol. 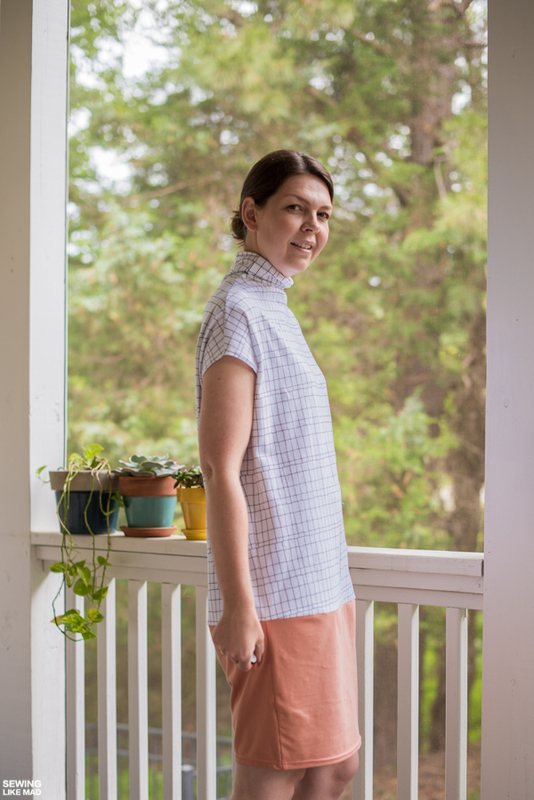 The white jersey with the black grid print is from Dear Stella - my first time sewing with their knits but not the last! The burnt orange is from Nosh Fabrics (color called Pheasant). How do I know that it's the fabric that is the problem (or you can say fabric recommendation since I actually followed those) and not me making the wrong size? 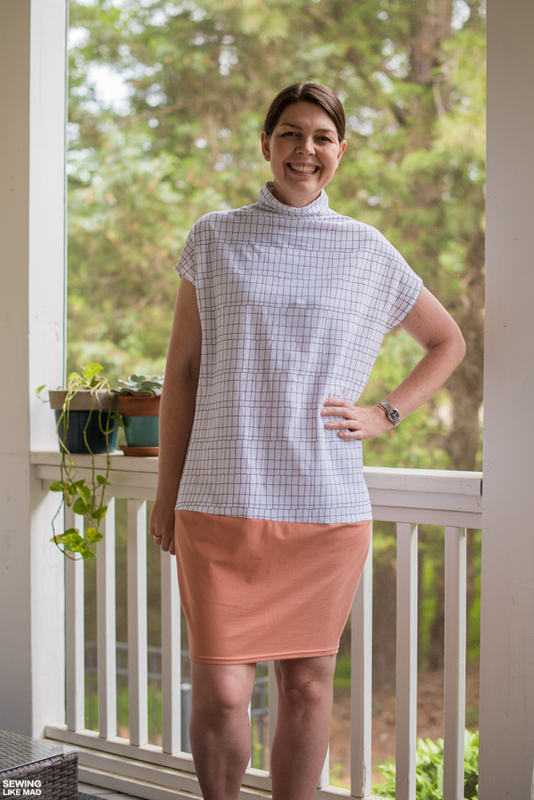 Well, my hip measurements put me exactly in a size 12 (but my bust is between size 6 and 8 and waist put me between size 8 and 10) so it's always the individual styles and their finished garment measurements (or pattern measurements as they call them) that help me decide what size I eventually make. In this case it was a dress with plenty of extra hip width so I knew I could easily size down to accommodate my smaller upper measurements. So I made the size 8 and it was still too big looking at the hips which makes me conclude that's it's definitely not the size. Or could the pattern be all wrong? At the time I made it, I couldn't find any other photos of the dress. It was released in May 2017 so it's pretty new. But after finishing the dress both Style Arc themselves and the great Lara Thornberry* have posted photos of the dress and they both look great and way different than mine but with no changes to the pattern, yes, I did ask. And they both used fabric with way more drape than mine. So that also helped me with my fabric recommendation conclusion. *But her IG account is private so I'm not sure there is much point linking to that. Instead I'm linking to her blog because although she has not blogged this dress yet, she turns out to be the most prolific blogger I have ever seen. Wow. 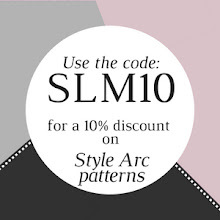 And so many Style Arc Patterns over there. Also what in the world happened to my cutting of the bottom of the white fabric, hahaha. Talk about a slanted line. So what changes did I do? Well, of course I took in the side seams beginning sort of at the bust ever so little and then quite a lot at the hips so it ended up being fairly snug over the hips. Then I also made the horizontal seam (connecting the white and the burned orange fabric) much less curved at the center front and back. That gave a less round shape too. But you don't want it totally straight. It still need to be curved for a great fit. I just needed less than what the pattern has. My last change was (as far as I know) not connected to my fabric choice. 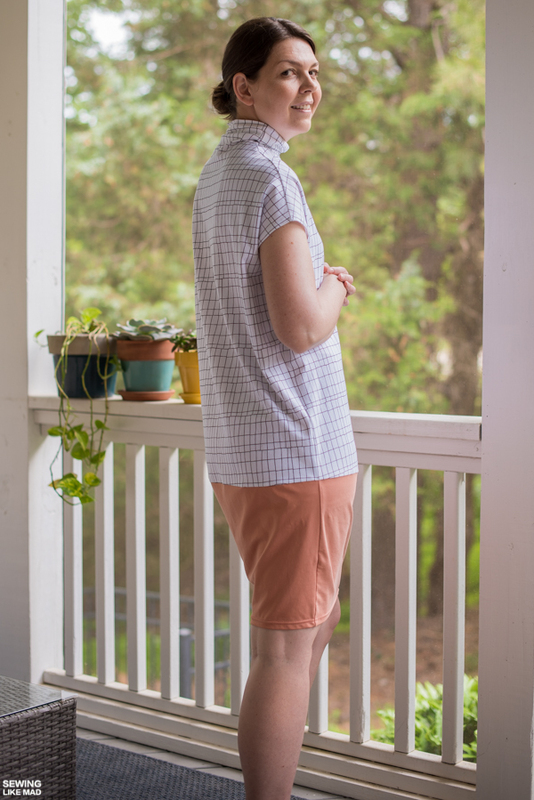 It was SO tight at the very very bottom of the hem that I had to shorten it since well, too tight clothes are much harder to fix than too loose clothes And I didn't feel like wasting this lovely fabric by cutting new pieces. Or making a slit in the side seams. So I shortened it 5 cm / 2", since a cone/cocoon shape will always be wider further up. As much as I don't think it looks too short, I still would have preferred it longer, so I have widened it at the bottom on the paper pattern for future dresses by using the slash and spread method. 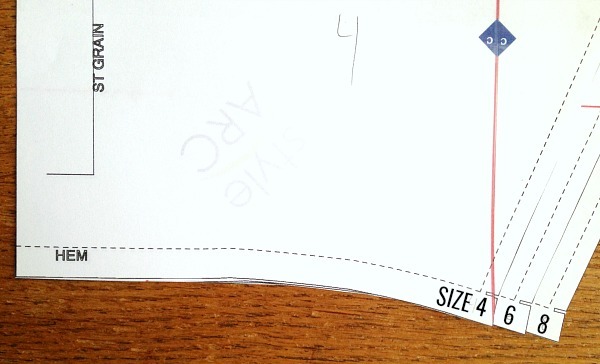 Oh, by the way I also added 10 cm / 4" for total length of the dress at the lengthening line on the pattern. Which was lucky or the hem would have hit be further up on my thigh...which is not as narrow as my knees. SO I added 10 cm to the upper bodice and then took away 5 cm at the bottom hem, so this dress is 5 cm / 2" longer than the original pattern. Phew, lots of numbers in this post. But I actually went a step further. I did some investigative blogging, haha. Because I had this feeling that the problem I had with the bottom of the dress was a grading problem. Meaning that the hem circumference was graded the same way the hip, waist and bust circumference/measurements were graded. Which is normally not a problem with dresses and skirts because the width is either the same(-ish) as the hips or wider. But it does become a problem when we are talking knee-tight garments. StyleArc Patterns are jumping 5 cm / 2" between sizes (e.g. this dress has a finished garment hip measurement of 124 cm / 49" for a size 10 and then 129 cm / 51" for a size 12 etc etc) and that is all good. But the problem with this dress is that they are doing the same with the hem circumference. And without being a body expert I'm going to claim that our knees does not change as much in size as our hips, waists or busts does. Sure it changes some but not 5 cm / 2" per size. I actually printed out the hem piece of all the 3 sizes I have, to check if my suspicion was correct and it looks like it is. I thought I could just as well show you too, in case you are the visual type (like me). 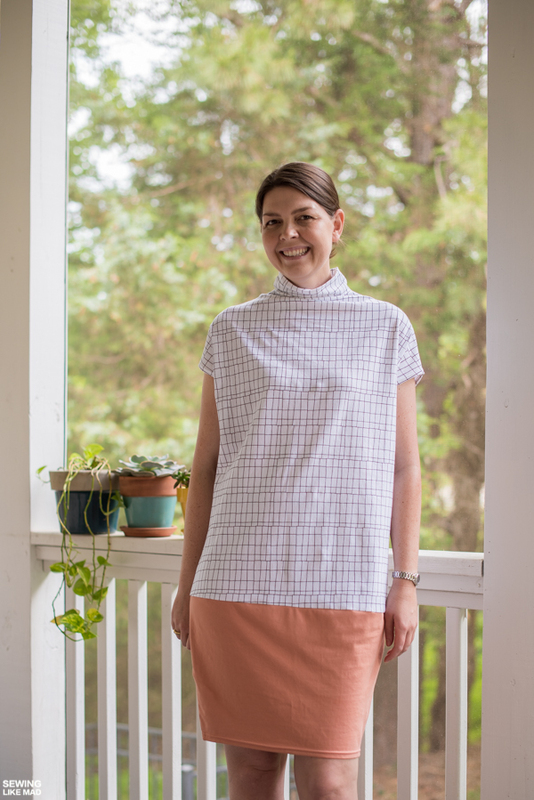 So if you are sewing the smaller sizes you will end up with the dress being very tight at the hem and if you are sewing the bigger sizes, it will be loose at the hem. In other words the grading is changing the design/final result of the dress (since it's cocoon shaped) and that is unfortunate. 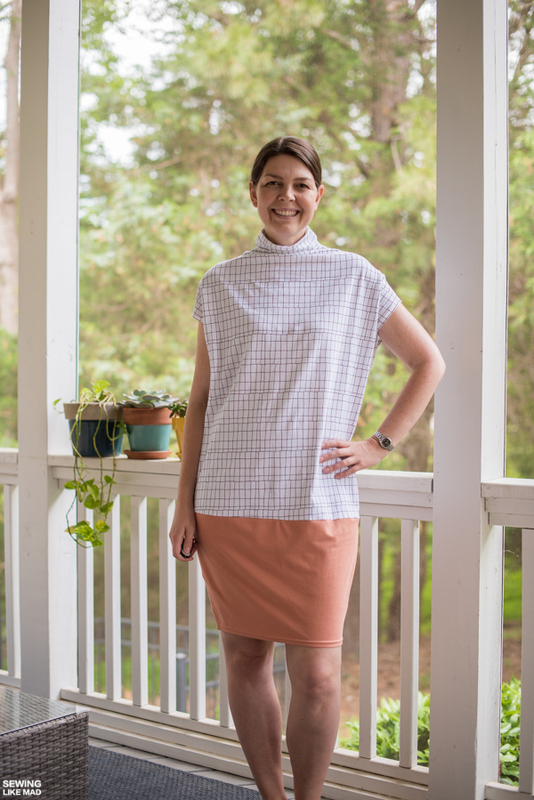 And yes, I have been in contact with StyleArc with my issues and they came back to me with the most gracious, professional and friendly reply. 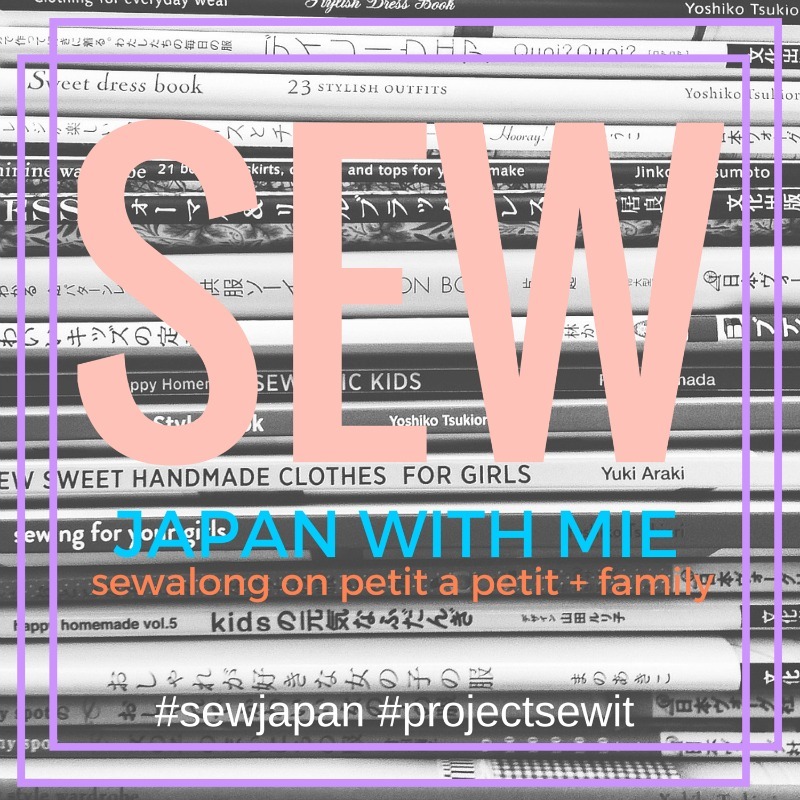 And yes, they are still one of my very favorite adult apparel sewing pattern companies. One, or maybe a few, mistakes does not take that away. I'm certainly not perfect either in anything I do. This is the only pattern out of the five patterns I have made from them so far, that I have had any problems with. The others have been nothing less than perfect both technical and fit wise. But you know my promise to you about honest reviews and I know you appreciate them. Plus this dress simply ended too good not to show you. So here we are. So let's move on with me doing a whatever-that-face-means and conclude that despite some problems, I do love my modified Cher Knit Dress. And I would also love to try to make it in the appropriate fabric with lots of drape for the original pattern (plus added hem width). A viscose/rayon cotton or bamboo knit blend would be perfect for that. Get your own Cher Knit Dress pattern HERE. I would like to know what would have happened if you would have used all the "right" sizes for your body: so between a six and eight for the top, flowing towards 8/10 around the waist and then 12 for hips and below... That's always how I try to fit patterns to my body. Except for very wide skirts or so. Then I would have ended up with an even bigger literal pear shaped dress.....again talking from the perspective of the (not suitable) fabric I used, so I don't think that would have worked better for me :-) If I'm using slinky fabric with lots of drape on the other hand then a more exaggerated hip circumference could be cool for sure, which is also how the dress is meant to look. Yes... Waiting to see your next one then :) If and when you decide to try again ofcourse. Thanks for your honest review Mie. As you know I gave Cher in my stash. I have made mental notes about fabric type & hem circumference. Enjoy your new dress... it looks fab! The final result is awesome! Too bad you had to go through all the trouble! Such a great and super helpful review! Well done. The big, boxy top ONLY works because you've narrowed the hips. Otherwise I think Moomintroll in a potato sack would have been the result. 😁 I am always nervous about patterns where the size lines seem to run parallel to each other at every point, and I know nothing about grading, I just know about anatomy. 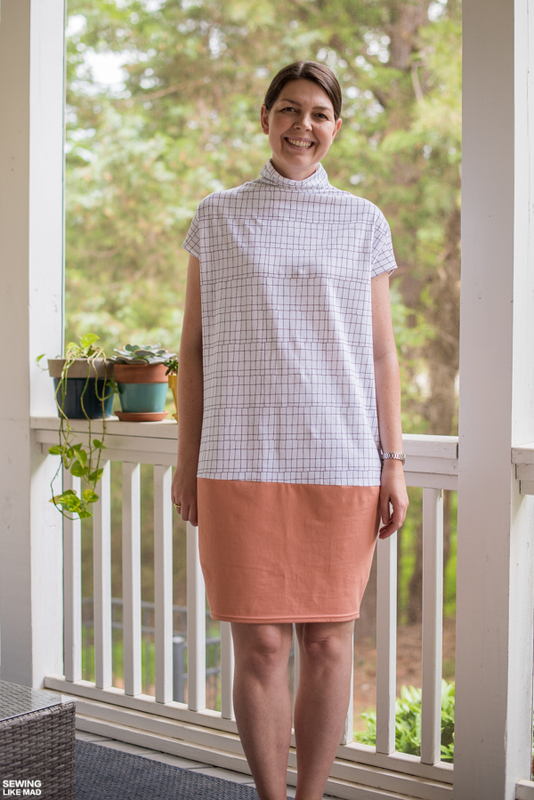 Glad you like the final dress and such lovely photos of you, nicely blogged Mie. Another really helpful review with so much information, as always! I love these posts. I love the final dress with all the alterations! So pretty on you! Glad you could make it work! Thanks for the honest review and the grading lesson. I love a good honest review. One with constructive criticism from an experience seamstress. Thank you so much for taking the time to write it. And I love your dress. It's very "Mie" and looks lovely on you.